How can this happen now? In 2018, people finding safety and refuge away from the authorities that wants to return them to their native place of origin, even though they have been in this country for many years. Of course, our president isn’t helping matters by separating children from their parents. That kind of thinking takes a certain amount of evil so deep inside that it has no choice but to pop out creating mere chaos. I’m just saying! Director/producer Stan Zimmerman (Yes, Virginia, Knife to the Heart) heard about the story of an undocumented Mexican woman and her two daughters, keeping out of sight from ICE and found help from a Jewish woman and later with Rev. Zachary Hoover, the executive director of LA Voice, an organization that aids people from different religions and races seeking help to improve their lives. Zimmerman took an actual event and flipped the script. 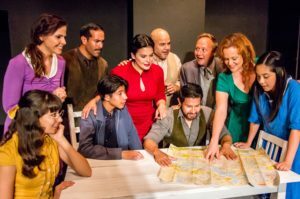 This time around, a Jewish woman keeps a Mexican family from being captured by immigration authorities. 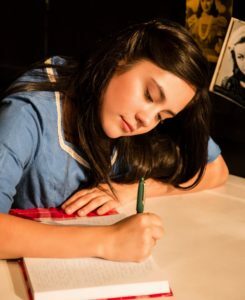 Before she became a symbol of survival and hope, German born, Jewish raised Anneliese (Anne) Marie Frank (Genesis Ochoa) was a young student who loved to read and write. She and her family, mother Edith (Tasha Dixon) and father Otto (Emiliano Torres) and older sister, Margot (Teddi Shaffer) left Germany when the Nazis gained controlled. They were able to move to the Netherlands and hide in a building where Mr. Frank worked behind some bookcases that he built for the family and later, some new arrivals. Everyone was safe for about two years until they were found and sent from Auschwitz to Bergen-Belsen concentration camp, where they probably died from a bacterial infection that causes fever and a rash and died a few months later. She was only 15. At 13, she received a homemade, autograph book and used it as a diary. She began writing about her experiences and became a voice for the people who shouldn’t and wouldn’t be forgotten. Ochoa’s version of Anne is strong-willed, childlike and girly. One minute she’s arguing with her mother over something so insignificant but is loving towards her daddy and shows interest in her first love Peter Van Daan (wonderfully played by David Gurrola). The young couple have a sweet scene in the attic of the building where both Anne’s and Peter’s family are hiding out. It’s a tender moment to watch these two kids have an innocent romance manifesting in a hopeless situation. Actress Raquenel plays Peter’s mother Mrs. Van Daan who is used to a life in luxury. It takes her a long time to accept her current situation. She isn’t mean but, she’s bitter. Who wouldn’t be in her situation? Anne does reveal some childish nature, sometimes being selfish but not in an overt manner where she’s disrespectful toward others. She’s in a perilous situation and lives day by day. That’s scary for an adult. Imagine, if you were 13? That’s a lot of responsibility to handle. The husband/wife team, Albert Hackett and Frances Goodrich wrote The Diary of Anne Frank for the stage based on the book The Diary of a Young Girl. The show premiered on Broadway in 1955. Playwright Wendy Kesselman (My Sister in this House, I Love You, I Love You Not) wrote a brilliant adaptation that is filled with heart and soul. From the budding romance of Anne and Peter to Mrs. Van Daan reluctantly giving up her mink coat to sell for food, Kesselman understands human nature. In this case, it’s survival but it must serve all. Anne manages to give everyone gifts for Hanukkah. She was truly the voice for the disenfranchised and shall be remembered for her courage and tenacity for striving to do good. She was quoted back on January 12, 1944 in saying, “Who would ever think that so much went on in the soul of a young girl?” It turns out, a lot of people would know. And if they don’t, watching this play would satisfy their curiosity.